it was gorgeous. Oh, wait ... I already said that, didn't I? So, the kit came home with us and Catherine promptly became involved in other activities. I wasn't going to push her because you just can't force a hobby on someone; they need to want to do it. I got involved in all the other stuff that I was doing ... sewing/quilting and other ... and the kit got put away and continued to age nicely. Sadly, this specific quilt is no longer offered by Starr Designs (but they do have 2 very similar ones: Butterfly Magic and Summer's End ... these other ones are embellished with appliques and have additional borders). It's kinda like how I feel about scrapbooking ..... that little 8-1/2" x 11" sheet of paper is a blank canvas that you can do anything you want. Except that the emptiness absolutely paralyzes me. I haven't a CLUE what to do. If I feel that way about a small piece of paper, imagine how I felt about this 78"x107" expanse! Then, I happened to buy a book on a new way to quilt feathers. 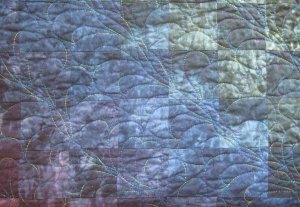 Feathers are considered to be the epitome of quilting skill. If you can make proper feathers, by golly, the world is yours. There are all sorts of instructions and videos to help you make traditional, heirloom feathers. But if you don't do them well, they look simply awful. The book that I bought was "Hooked on Feathers" by Sally Terry. Sally has discovered a VERY friendly way to create the look of nested feathers with a technique that is virtually foolproof. 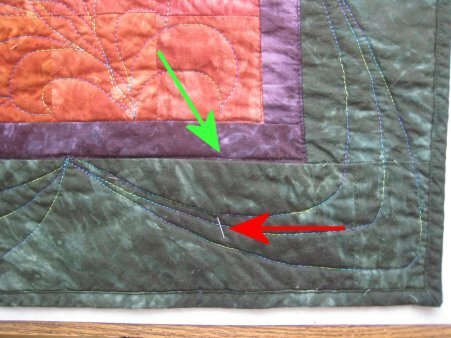 It's useable by all machine quilters, using your home machine all the way to a longarm. They are easy, they are forgiving, they are fun ... and they look terrific! 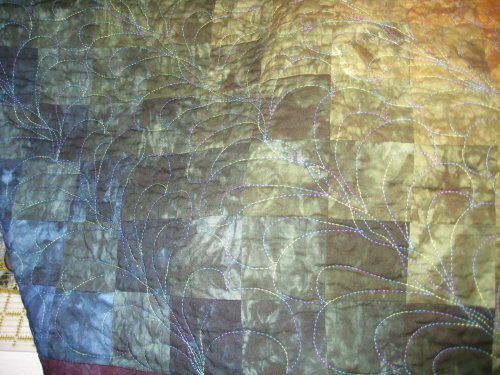 I thought that the big expanse of the Rainbow quilt would look good with the Hooked on Feathers as an all-over design. Then, I had to do the second diagonal band. Ooops .. angst time. How far apart should they be? If I need to have the feathers touching each other, how far away do I need to stitch the spine (which is done first) and still have enough space for decent feathers adjacent to the spine? And will I be able to be consistent in the size of the feathers from diagonal band to diagonal band? And how do I do the small areas at the ends? But, I soldiered on ... stitching band after band ... marching across the quilt. When the first pass of feathers was completed, I stood back and looked at my work. I gotta admit ... I was really, really pleased! The LAVA thread was looking terrific; Lizzie was stitching perfectly; the feathers were just fantastic! 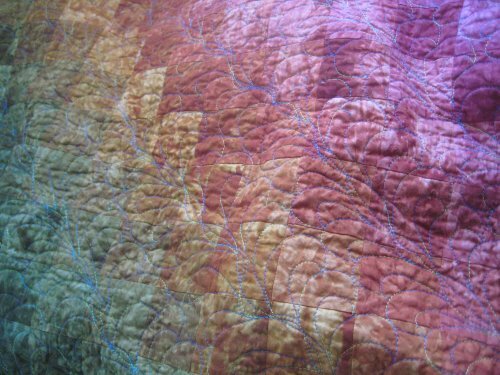 And then it was time to advance the quilt and stitch on another, newly exposed area. Angst time again! Would I be able to do the next row of feathers as nicely as those on the first pass? Would the new feathers be the same size and shape? And more importantly, would I be able to "attach" the line of new feathers to the bottom of the previous diagonal row well? I worried about all sorts of things and would procrastinate before each new step. But, once again, taking courage in hand, I proceeded ... and succeeded! All my concerns were for naught, thank goodness! Eventually, it arrived. :-) It took me a while to stitch all the feathers, since 78"x107" is just a whole lotta real estate to cover. As I was stitching, I was hoping that the swag template would be getting back in stock because I still needed to do the borders! Finally all the feathers were stitched and I was just so *impressed* with how EASY the Hooked on Feathers were to do! To be sure, they are "casual" feathers, not traditional ones, but if you are holding back because doing perfect traditional feathers is intimidating, then *these* feathers are the solution! They create a nested feather look; you are getting two feathers for every one that you do. The nested feathers look so wonderful! I *loved* the color variation in the LAVA thread and it worked just so perfectly with the shades of the hand-dyes. BUT .... those borders. The templates still weren't in stock and I just did not want to leave this quilt on Lizzie until them came in. For a previous quilt, I had made my own swag templates ... kinda clunky but they worked ... and decided to use them instead of the ones from Constantine Quilts. Her instructions will work for any swag templates and they did so for me. My corners came out nicely, although not quite the shape I had imagined, as I needed to use the template I had on hand instead of a better commercial one. 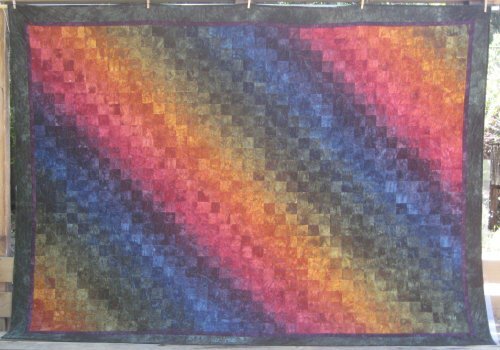 Finally, the entire Rainbow quilt was done and with some trepidation, I dumped it in the washing machine. Always, always, the last thing I do with my quilts is launder them. I want all the accumulated dirt, debris and ::sigh:: cat hair removed from it before I use it or give it away. It also lets me know that all of my stitching for the quilting and binding will hold together. I usually use "normal" batting ... Quilters Dream, Hobbs, and others ... of cotton, polyester and/or bamboo. All of these battings take "normal" laundry treatment. You don't need to be concerned about special handling. 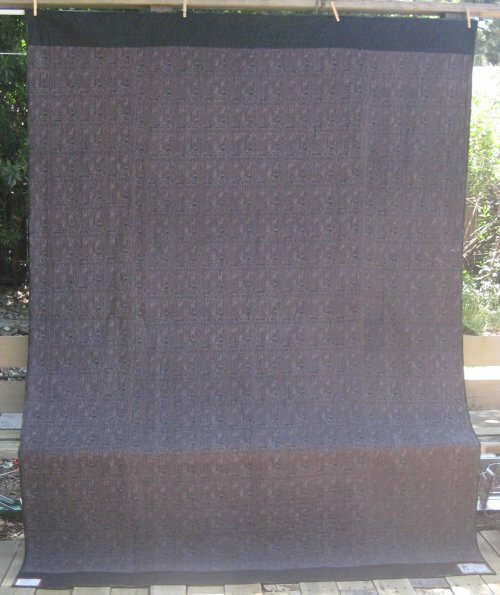 For this quilt, however, I used Tuscany silk batting by Hobbs. Why? Just cuz. ::shrug:: I had heard it was lightweight but warm. Warmth without suffocation. And it sounded like a cool thing to use. :-) Unfortunately, it *does* have special handling considerations and before I used it, I went over them with Catherine to be sure it was something that she would remember. It's supposed to be hand-washed and laid flat to dry. But, really ... who is going to do THAT with a big quilt? I talked with the Hobbs people and they sent me the PDF of care instructions, which said (in part) that GENTLE machine washing in cool water was permissible but machine drying was discouraged. Still .... needing to lay a big quilt flat to dry is just annoying and if you're in a small apartment, it's going to be impossible. So ... what did I do? I washed it on GENTLE in cool water and, yes ... put it in the dryer on air fluff. It did shrink ... just like the instructions said. The newly quilted quilt was originally 78" x 107"; after machine laundering, it shrunk to 76" x 104". That's a 6% shrinkage ... y'all have been warned. It's quite possible that IF I had hand-washed it AND air-dried it flat as recommended, it might have stayed closer to the original 78"x 107". But, I need to keep in touch with reality ... and what the recipient is really going to do. :-) I did put a 'special care' label on the back of the quilt as a reminder. 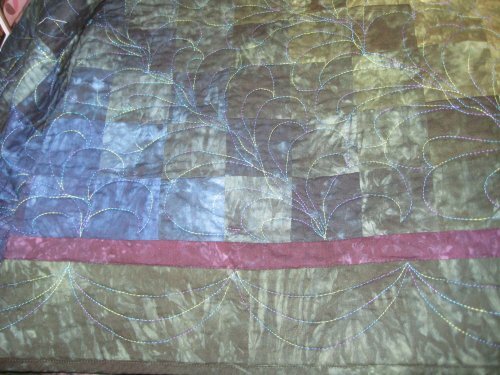 It was after all the quilting had been finished and after it had been laundered and as I was folding it, I discovered to my utter horror, that I had QUILTED a flower head pin into the quilt! Oh. My. Goodness. How did that GET there?? I certainly don't remember putting it there during the loading process, but it's obvious that I did. See that red arrow? That's the pin! You can see the corner swag quilting lines all around it and Lizzie didn't hit the pin with any of them. I'm almost delirious with relief! It's a wonder Lizzie's needle didn't hit the pin or the flower head of the pin, which would have caused all sorts of problems that I certainly don't want to deal with. I could have severely compromised the timing of Lizzie, which is a problem I've not encountered "yet" ::knock on wood:: and one that I hope to avoid, like, forever. I'm *so* thankful that I discovered the pin before I mailed it because it would have been awful if she had stuck herself and I simply shudder at what attempts at "fixing it" Catherine would have employed. Yes, I'm sure she would have done her best, but she does NOT have any real sewing skills. It occurs to me that I haven't discussed the backing. 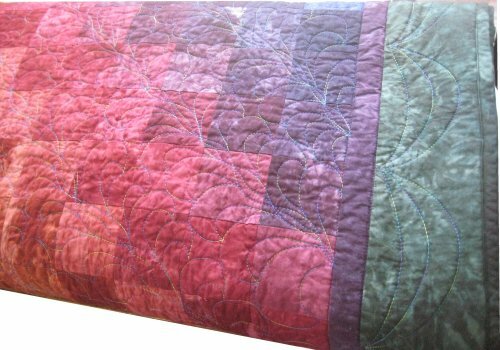 For some of my quilts, I have used regular quilting fabric. Nice stuff, but expensive for an area that isn't going to be seen. For other quilts, I've seamed together remnants of fabric to "create" yardage for a backing. Thrifty, but not for this quilt. 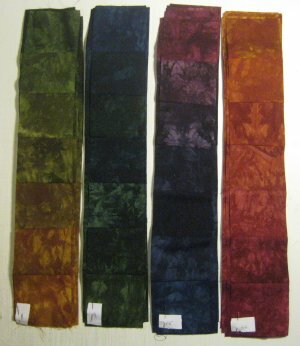 Recently, I've been using extra-wide muslin (like 90" - 100" wide) so that I have a seamless backing. Having no seams in the backing is a true luxury for longarm quilters but I didn't want that for this quilt. I had in mind some sort of rainbow .... or mottled batik ... but nothing that I saw really floated my boat. It was when I was haunting my local Joann's store that I saw THE PERFECT FABRIC! 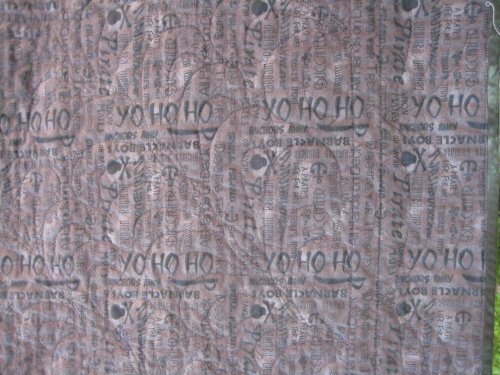 I bought a "whole bunch", laundered it and when the top was done, folded both the top and pirate backing fabric into quarters to ensure that the backing was larger than the top. Geez, Louise ... either I mismeasured the top or asked for the wrong yardage because the backing was NOT big enough. ::smack head on wall:: I just did NOT want to return to Joann's to buy more so I simply added a border at the top & bottom of the pirate backing.